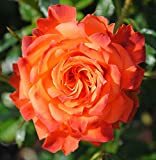 Miniature rose growing shrub‎ of the genus Rosa also known as Dwarf rose, Miniature rose perennial deciduous used as ornamental cut flower plant some cultivars can grow as house plant, can grow in temperate, mediterranean or subtropics climate and growing in hardiness zone 6-10. Leaves color green shape elliptic that grow in pinnate structure. Flower color can be: red, pink, orange, green, purple, yellow or white, the flowers multipetals.